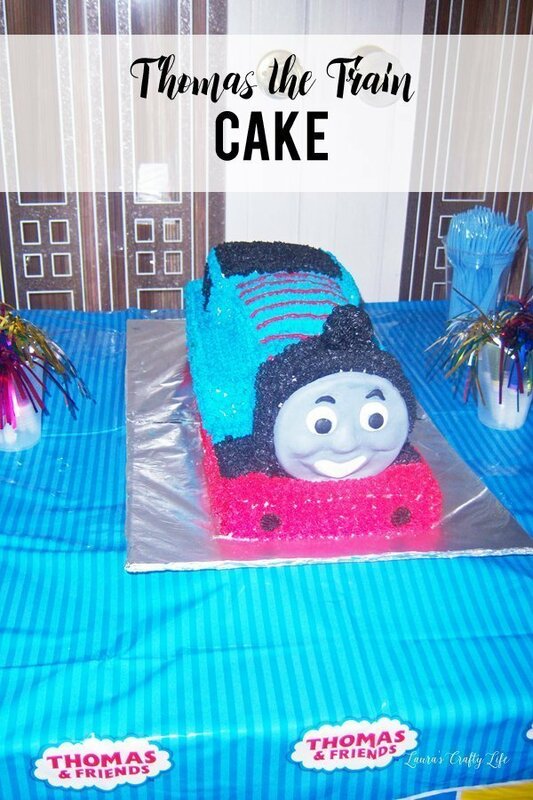 For my son’s second birthday we did a Thomas the Train theme. I love to make the cakes for our birthdays myself. And, although I am no professional, I felt like this one turned out pretty good! I pieced the cake together from several 13″ x 9″ cakes. I cut and shaped the different layers to create the main shape of the train. Each layer is separated by a layer of frosting. 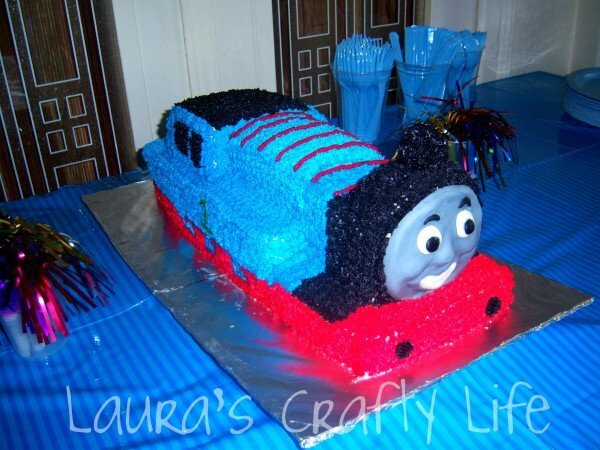 I used a star tip to decorate the main part of the cake with buttercream icing, using one of my son’s toy trains as a guide. The face is made out of marshmallow fondant. This was my first time working with any kind of fondant. I asked a friend for a recommendation and this was the recipe she recommended. You work with it like standard fondant, but it actually tastes delicious! I started by creating a large gray circle and flattening it out. I shaped the nose, cheeks and mouth area. I added white fondant pieces to create the eyes and mouth. Lastly, I shaped two black circles for the eyes and small black pieces to create the eyebrows. I attached the face piece with buttercream icing. It was a big hit at the party! And I was super proud of myself for creating a 3D cake. Chris – I created this cake before I started really blogging. I don’t have pictures of the steps. 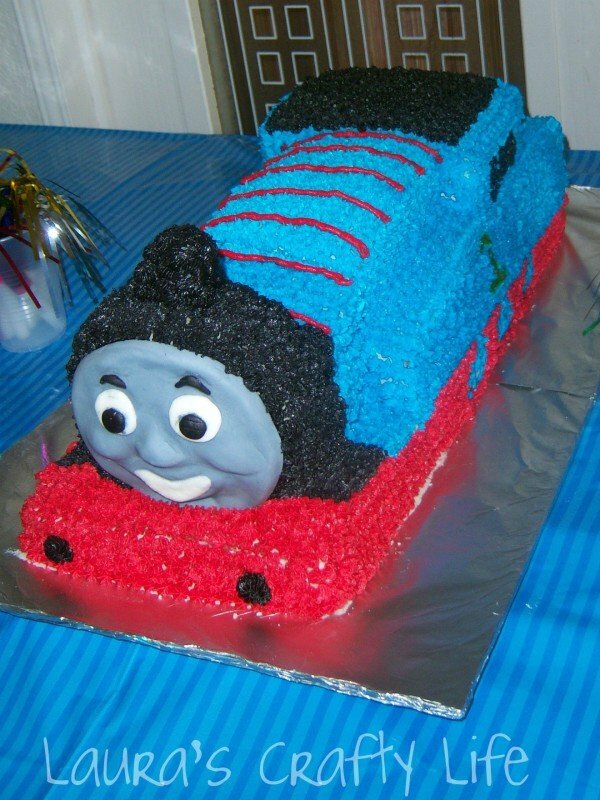 I baked a few rectangular cakes and pieced them together using a picture I had of the train. Then, I used a star tip to decorate it. 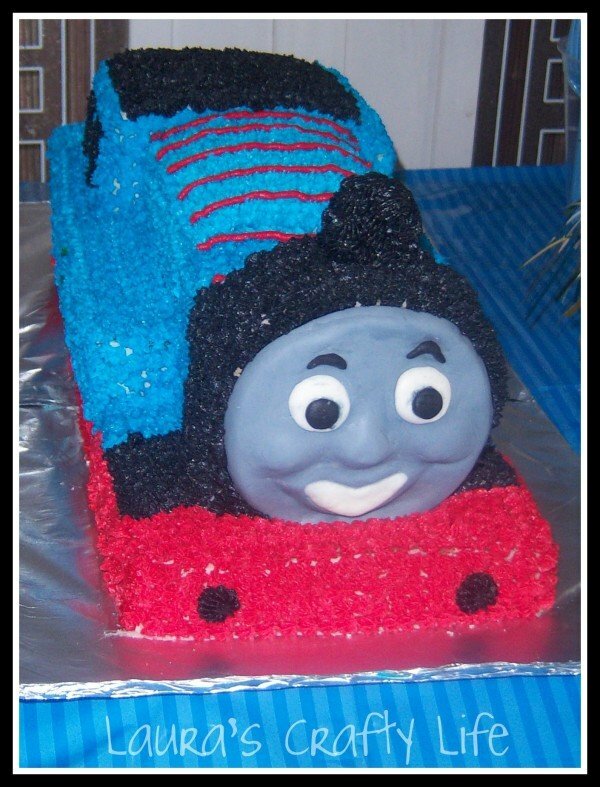 To make the face I used marshmallow fondant and shaped it to look like Thomas’ face. Sorry I don’t have more specific instructions for you!